Squeeeee! 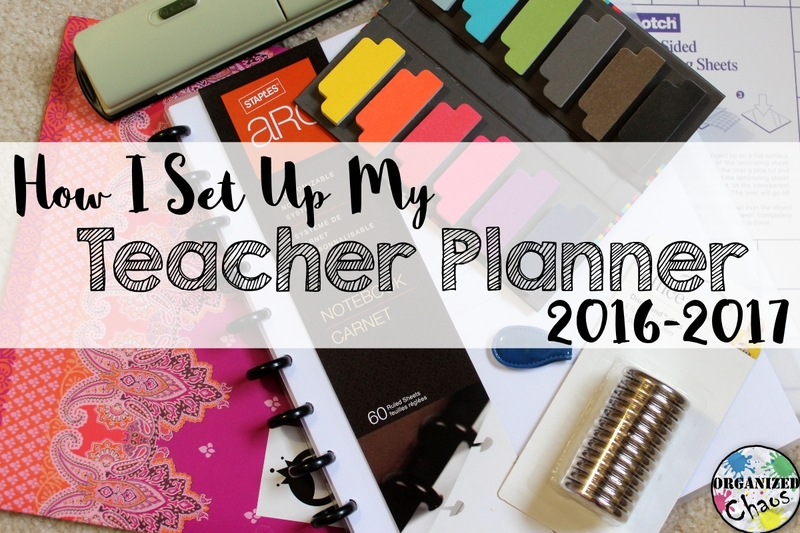 It's that time of year again: I've got my 2016-2017 teacher / home / everything planner set up! A lot of my setup is the same as last year, but there are a few changes that I'm really excited about. 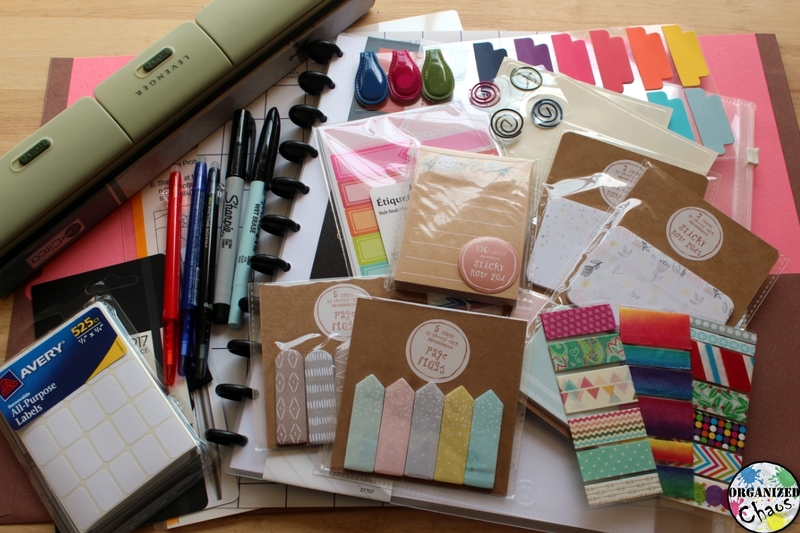 ALSO there is a huge giveaway at the end of this post, so make sure you read to the very end! I'm using my Arc notebook again for the outer hard plastic covers (although I am contemplating a change- still discbound, just a different cover... I'll let you know if I change my mind! ), but I did upgrade my discs (the binding on the spine) to larger, silver ones. 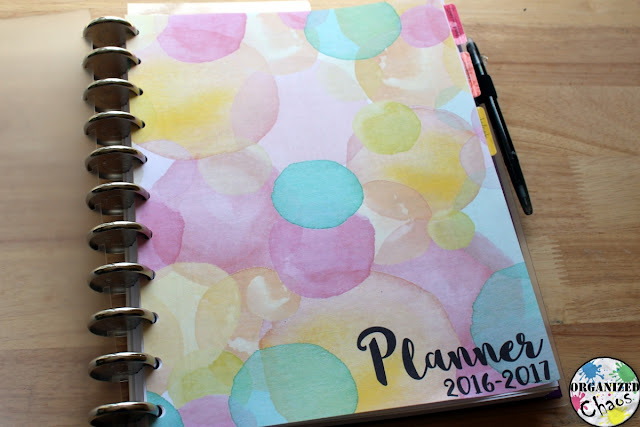 I got into decorating my planner quite a bit this year, and I found that the smaller discs just aren't big enough anymore with the added bulk from stickers, paper, and extra pens. Plus the silver looks so pretty! One thing I learned and improved this time around: I like to have a nice, big dashboard so I can keep wider sticky notes on there. I also left some extra laminate around the paper- my old one is starting to split at the top from all the wear and tear. 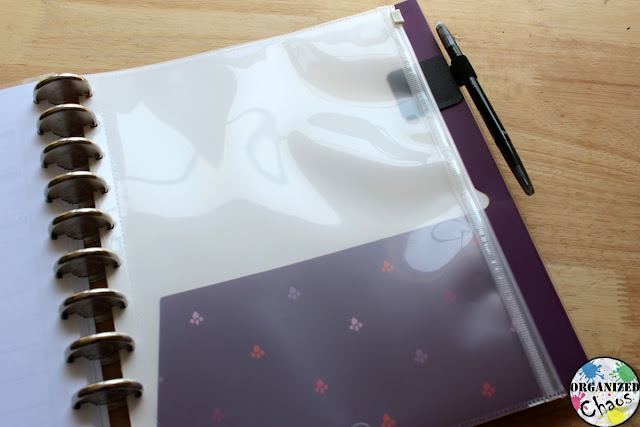 It's quite simple to make- just cut the folder in half and hold punch- but if you want some visuals of how I made it go to last year's setup post (linked above). 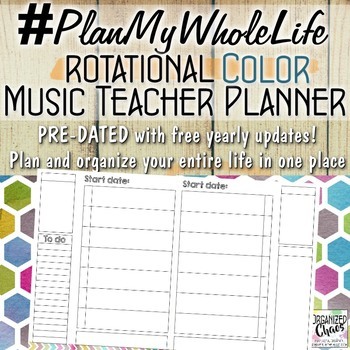 If you're interested, click here to see all of the teacher planners in my store. Want more? 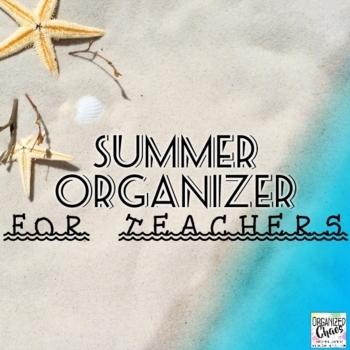 Subscribe here to the Organized Chaos newsletter and get music teacher ideas and resources, including tons of lesson plan content to put in those planners, sent straight to your inbox! 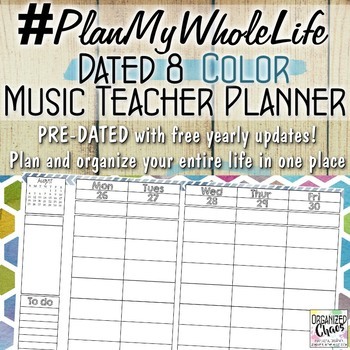 2nd prize is an Entire Life Planner in the format of your choice. And guess what? 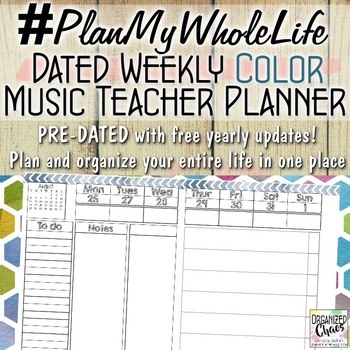 I now have ink-friendly AND full-color options for each of the six lesson planning formats! 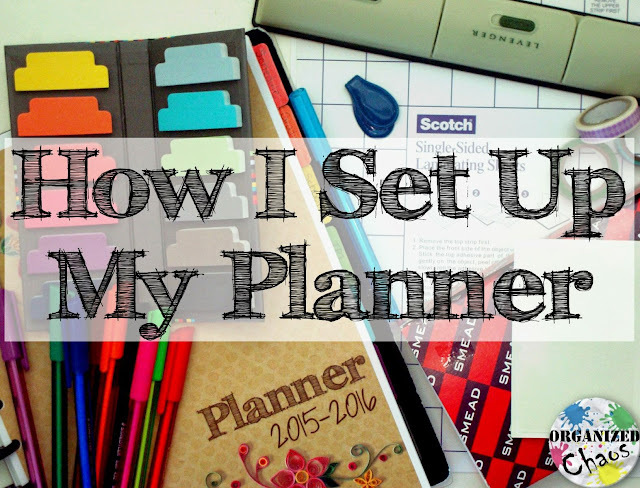 This is seriously everything you need to set up your planner exactly like mine! There is an Arc notebook, folder, discbound hole punch, a single-sided laminating sheet and a laminating pouch, Arc zippered pouch, paper tabs (4 each of 12 colors), adhesive pockets (I didn't use these this year but I did the last two years- see last year's setup post for how I used them), adhesive pen loop, 3 magnetic clips, 4 spiral paper clips, Avery label stickers (I make my own planner stickers with these- see this post for details), flag and quote stickers, sticky notes, page flags, a small notepad, washi tape (samples of 19 different kinds), wet erase marker, Sharpie pen (for writing on washi tape), and 3 of the most awesome erasable pens ever. Guys, this is HUGE! Enter as many times as you like below (each option is a separate entry). The giveaway is open for 2 weeks until June 14th. Good luck! Whoa this would be a dream come true as being in Australia I have searched High ad low for those darn arc things since I got my planner last year but they dont sell them here. 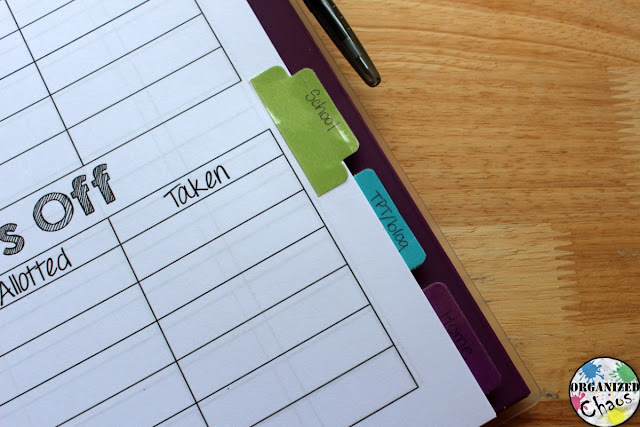 You're planners are just beautiful and would assist in covering the addiction to craft at the same time being absolutely useful for work. All too often I find my crafting gets left behind because of work. PS would pay the postage if I won. 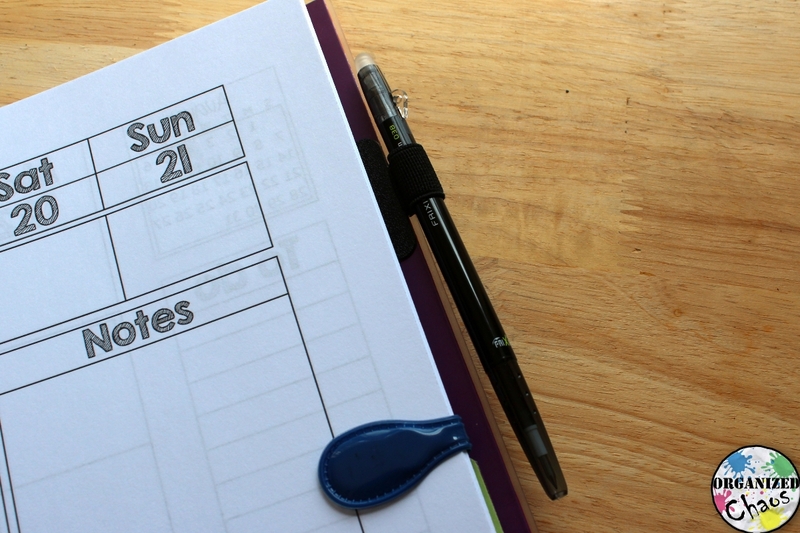 I liked seeing how you set up your planner. 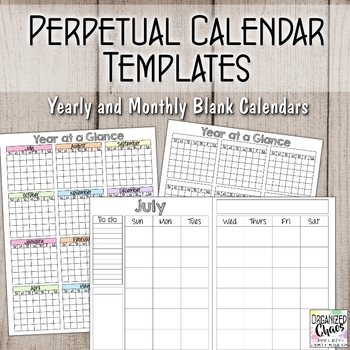 My favorite planner format is my own- a planner I created in Word which I have bound at an office store. 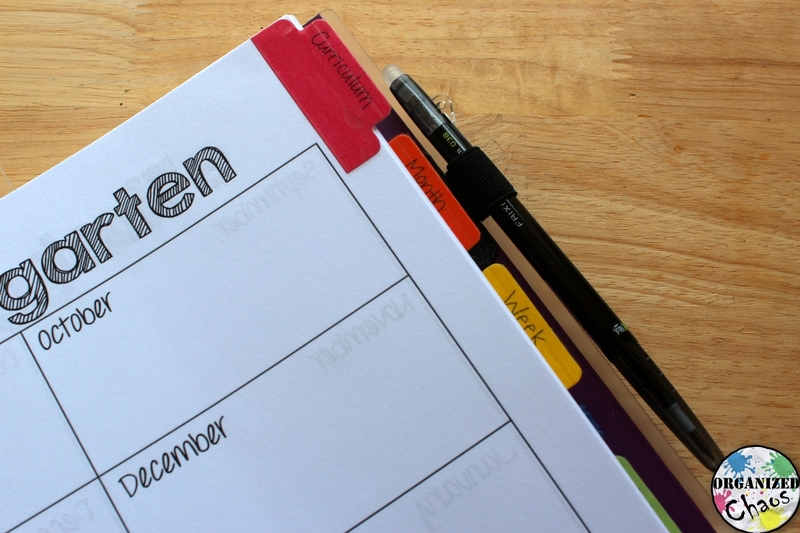 This year, I used the same tab dividers that you show. I haven't clicked back yet to see how you laminate yours, but I simply use glossy tape after I've attached the tabs to the monthly layout tabs in my calendar. Where did you get your cute post-its? The post-its are from the Target dollar spot. They come out with some cute ones every now and then and I was able to snag some before they were all gone (which doesn't happen for me very often!). 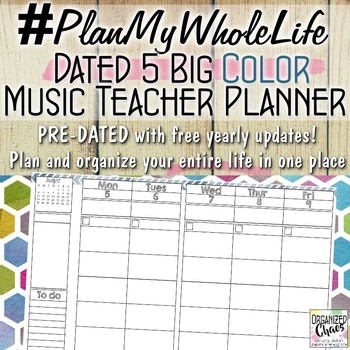 Your planners are so organized and I absolutely love them! I teach K-7 General Music and 5-12 Band, will be in charge of a youth leadership seminar next year, and just had a baby girl. My goal this summer is to get your everything planner. It will help so much! 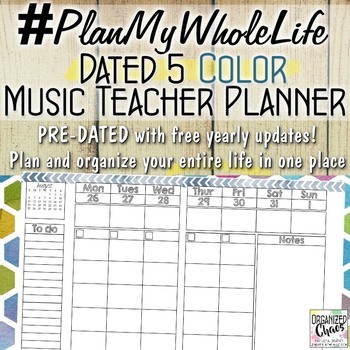 Thank you for creating this and helping us all stay super organized! 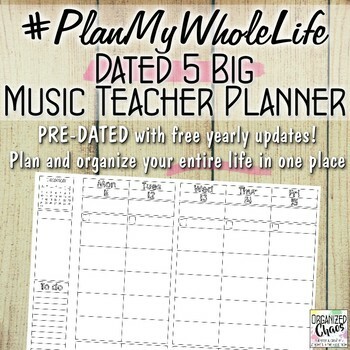 Sounds like the Entire Life planners are exactly what you need! ;) I made my first one when I went back to work when my daughters were 18 months. Congratulations on your baby girl, and enjoy! Good luck! This planner would be a God-send! Your blog is so fabulous. I just finished my second year of teacher (elementary music). 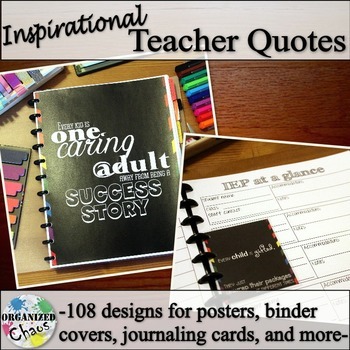 I love reading your posts and I love your tpt items! Thank you for taking time out of your busy life to blog and create such great pieces! Aww, your comment made me smile so big! :) I absolutely love blogging and creating, and I'm so glad that others enjoy reading and using the things I make! It makes it so worthwhile. Good luck in the giveaway! Whew, 2nd year and you've got a lot on your plate! Congrats on making it through the first two years of teaching- for me it gets better and better every year, I hope you find the same. Best of luck in the giveaway! 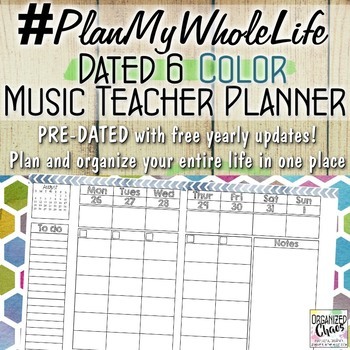 Loved using your planner last year and even more excited to print the color pages!!! Thank you for the giveaway!! Thank you for being involved in requesting the color versions- it was so fun to make them! I hope you enjoy them, maybe even for free! ;) Good luck! 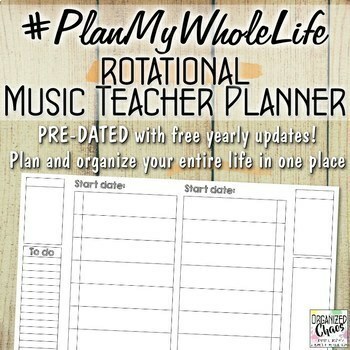 I was searching for ways to improve my current plan book for music K-8 and I love your weekly rotation edition. I love that you even thought to keep track of what lesson each sub has taught each class. I have never though of that! I started using your planner this year, but was only able to keep up with a paper planner for the first semester, with traveling between schools and downsizing to a small purse. I'm hoping to revamp my system and do better this school year! You know, every year I tweak my system as my needs change or I find things that work and things that don't. Having the flexibility to print the pages exactly the way you need is really helpful! I think it's pretty awesome! ;) Thanks for the comment. I love this!! I just finished my second year of teaching k-8 music, k-4 technology, 5-8 band, 5-8 choir, 2-8 gifted, piano lessons, voice lessons, ukulele lessons, sell Thirty-One and still need to keep track of my home life and this would be the perfect way to do it! Planners are my weakness. 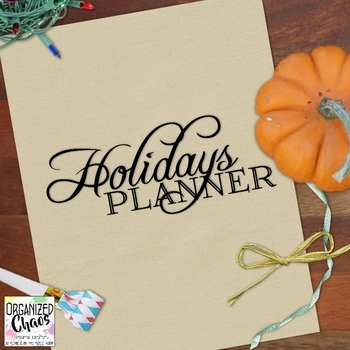 I write so much down that I have a different one for each area of my life and this planner would make my life so much easier! Thanks for sharing! 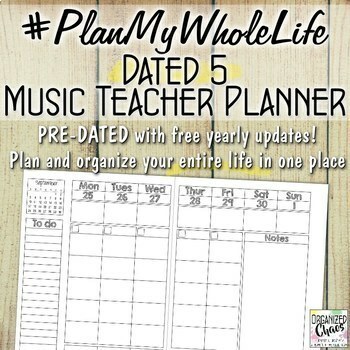 I would love this entire planner!!! Teaching k-12 at school, a private studio with approximately 25 students a week, and an adjunct professor at a local college it would definitely come in handy. I'll definitely be heading to your TpT page to check out purchasing!! Thank you! Ooh! I love the weekly rotational planner! 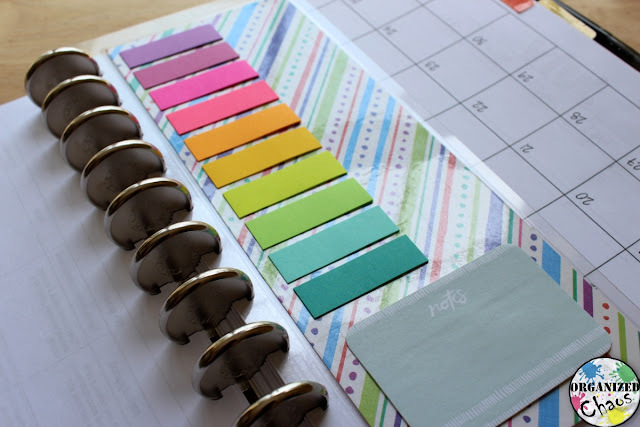 In color :) That's how I set up my planner last year. I teach several classes of the same grades, and I keep them doing the same things so just writing it down once helps so much! I bought one of your planners last year and just loved it! What do I need to do to update for the 2016-2017 year? Thanks! 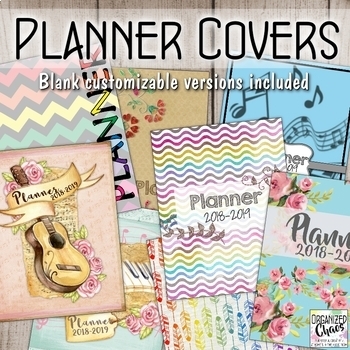 I love planners and these look awesome! I hope I win!! 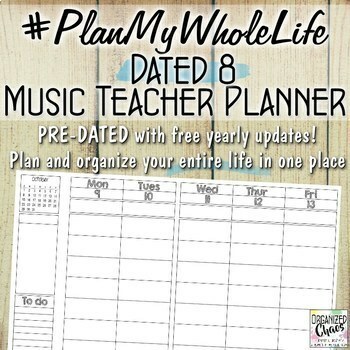 I have been doing all of my planning on the computer, using an Excel spreadsheet (which then I transferred to Google Sheets). I keep thinking that there has to be a better way to do it, and I am really into the idea that this could be it. I keep hoping something out there will improve my organizational skills..... Fingers are crossed!